Get your Good News here! Ronnie Earl & the Broadcasters eighth Stony Plain album, Good News, was recorded December 20-21, 2013 at Wellspring Studios in Acton, MA. The project and its recording was a time to remember as Ronnie gathered together the extended Broadcaster family of musicians and friends including Dave Limina, Lorne Entress, Jim Mouradian, Tom Hazeltine, Debbie Blanchard, engineer Huck Bennert, Boston area vocalist Diane Blue, guitarist Zach Zunis of the Janiva Magness band, guitarist Nicholas Tabarias from Detroit and many other friends of the band. Ten tracks, including Sam Cooke’s Change is Gonna Come, were recorded over the two days which concluded before the wee hours with a great holiday feast that may have included some puddin’ pie and many, many cups of coffee. The album title Good News came to Ronnie in the New Year right before we heard an NPR story on the fiftieth anniversary of Sam Cooke recording Change is Gonna Come and playing on the Tonight show days before The Beatles appeared on the Ed Sullivan Show. In the Wee Hours: Ronnie Earl Intro, Zach Zunis first guitar solo, Ronnie Earl second guitar solo. I want to send extreme and massive amounts of love to the band family: Dave Limina, Lorne Entress, Jim Mouradian, Tommy Hazeltine, Debbie Blanchard as well as Rocky, Suwanna, Barb, Michelle, Eddie, Donna and the extended Broadcaster family. Donna I am forever grateful I met you on that train. We are alive by the grace of God and without higher power none of this could be possible. We wish you all peace, simplicity, health, healing, positive vibes and good news. Hep’ me with these blues. Give rise to beauty from deepest pain. And find a home where they belong. Steve Morse of the Boston Globe calls Good News "another exquisite outing" by the "world-class Broadcasters." 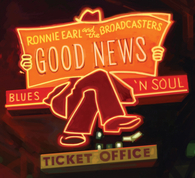 Thank you for the great comments on the Good News CD cover! The cover art is based on a vintage sign that Holger Petersen of Stony Plain Records and Michael Dangelmaier remembered seeing in the 60's in Edmonton, Alberta, Canada. It was located at Mike's News which was also the location to buy concert tickets. Michael and his company Karo Design in Calgary did a brilliant job running with the concept. Read the story of Mike’s News sign on the city of Edmonton website. Many thanks! Good News comes in at #7 on the Billboard Blues chart! For a better view check out our pictures on Flickr which are organized by sets or albums.